Gas powered lawn mowers can be a hassle to start, they need to be maintained year in and year out. They also produce a lot of noise and fumes. These factors have prompted quality lawnmower manufacturers and power tool manufacturers to offer electric lawnmowers, with an array of features. One problem with a plug-in or corded electric lawn mowers is the hassle of dealing with a power cord. If you aren’t careful the cord can trip you, get tangled, hook trees or other plants, and let’s not forget the constant fear of running it over! In the past, you had to simply live with these foibles. 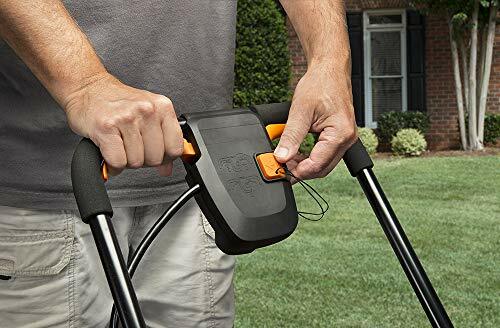 Fortunately, battery technology has advanced by leaps and bounds in recent years, so that you can viably cut a modestly sized lawn with a battery-powered electric lawnmower. Worx was originally a power tool manufacturer, who has now thrown their hat into the ring of yard maintenance. 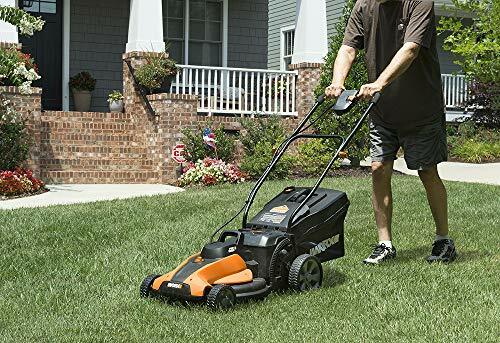 The Worx WG744 17″ 40V Battery Cordless Lawn Mower offers the convenience of an electric mower, while also operating on two 20V batteries. These batteries are also interchangeable with other Worx power tools. 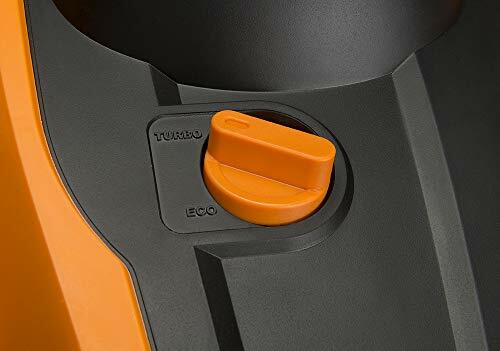 This means if you are already a fan of the brand, you can swap them out and interchange batteries for longer run time on the mower and other power tools. The Worx WG744 17″ Cordless Lawn Mower also has a 3-in-1 bagging, mulching, and rear discharge system. You simply install the bag or the correct attachment into the rear panel door, and it’s ready to operate. Honestly, though, the rear discharge isn’t really necessary, considering the mulching feature is just as convenient and leaves less total thatch behind. The bagger is nice if you want to collect grass clippings to add to your compost pile. It also comes with a fullness indicator to make sure you’re not overloading the back or leaving stray clippings behind. The Worx WG744 17″ Cordless Lawn Mower isn’t self-propelled, but it is lightweight, which makes it easy to maneuver. The 17” cutting deck also helps clear a broad swath of grass. The two 20V batteries are capable of mowing up to 5500 square feet of turf, which works out to a little over 1/8 of an acre on the charge of the two batteries. 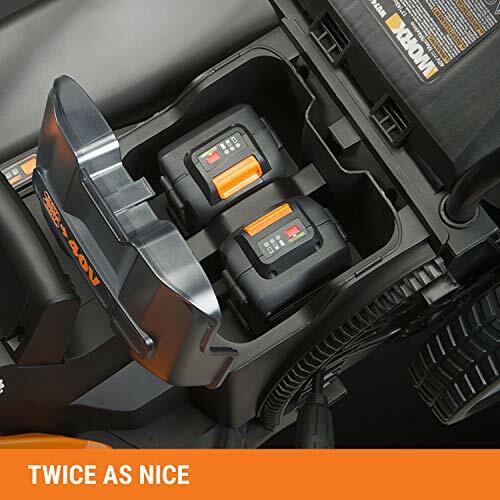 If you have other 20V Worx power tools you can use those batteries to get added mowing time. 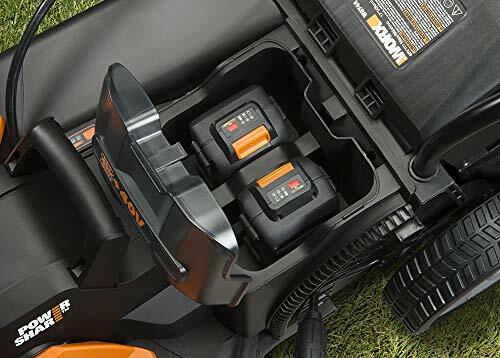 If you prefer you could also use the mower’s batteries to power other Worx tools when you aren’t cutting the grass. The Intellicut system applies added torque to the mower shaft when needed. This can be handy if you have thick turf, you are behind on your mowing, or the grass is a little bit on the damp side. As an electric mower, it is much easier to start and maintain than a traditional gas powered walk behind mower. The bagger and mulching attachments are easy to install. 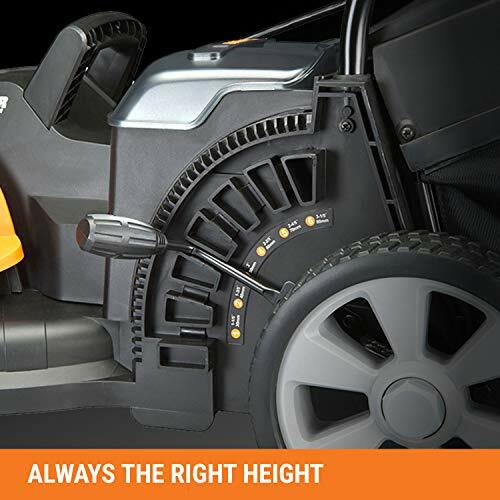 The height of the wheels and mower deck can be easily adjusted by a single level. This spares you the hassle of having to adjust each individual wheel. 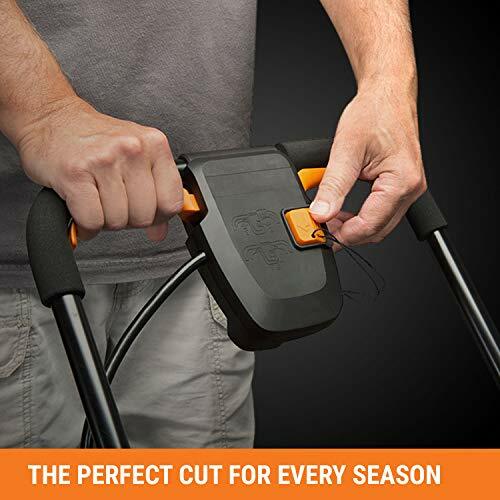 This allows you to cut as high as 3.2” or as short as 1.2”, which can be pretty handy at certain times of the year. It does collapse down for convenient storage. However, this does take a little more wrestling than you might think. 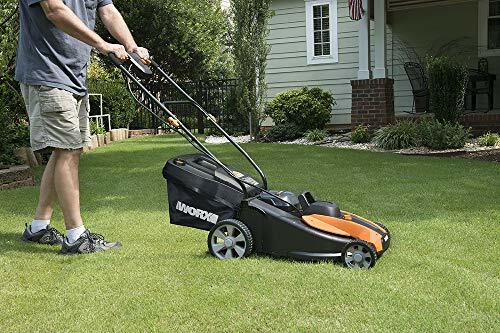 The overall quality of the Worx WG744 17″ Cordless Lawn Mower is good. It is lightweight and highly maneuverable, which is something that could have been compromised with a battery-powered electric mower, without a self-propelled feature. While it does do a good job of cutting, the battery life will be insufficient for cutting more than 1/8th of an acre at a time. The battery indicator lets you know how much power you have left, which can be helpful if you have additional batteries and you want to switch out to finish mowing a larger section of lawn. Like all lawnmowers, the blades will need periodic sharpening. Make sure to clear all the grass clippings out of the bagger. If you leave some behind they can rot or even start to foster unsightly and potentially dangerous mold. The Worx WG744 17″ Cordless Lawn Mower can sometimes be a little stubborn when you try to collapse it. So, be patient about it, if you get frustrated and try to “Horse-It” you could bend or damage something! The handle has a grip bar that disengages the blades with it’s not depressed. The Intellicut system provides extra torque when needed. The single lever adjustment for the deck height saves you a lot of time adjusting the wheels. The bagger and mulcher attachments are very easy to interchange, but the rear discharge realistically isn’t necessary. 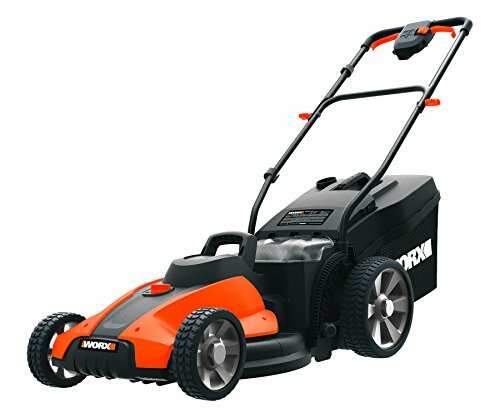 Compared to a traditional gas-powered lawn mower, the Worx WG744 17″ Cordless Lawn Mower is far cheaper to run as well as maintain. Like all batteries, they will eventually lose some of their life as time goes on. 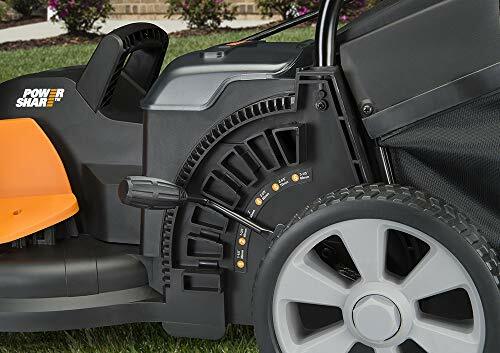 However, the Worx WG744 17″ Cordless Lawn Mower uses the same 20V batteries as many of the other power tools in their line. This makes it relatively easy to find and afford replacement batteries as needed.